Since we've had our holiday decorations up around here, Roadside has been having a blast. No, he has not knocked the tree down yet. It still stands firmly in the living room. It doesn't look so great though. All the bottom branches are bent and drooping down to the floor. With all of these things around that I'd rather my kitten not play with, I was excited to find a fun-looking toy for cats from Chewy.com. I thought that maybe I could get him to focus his attention elsewhere. Chewy.com sent over a Pet Stages Tower of Tracks Cat Toy for Roadside to play with. 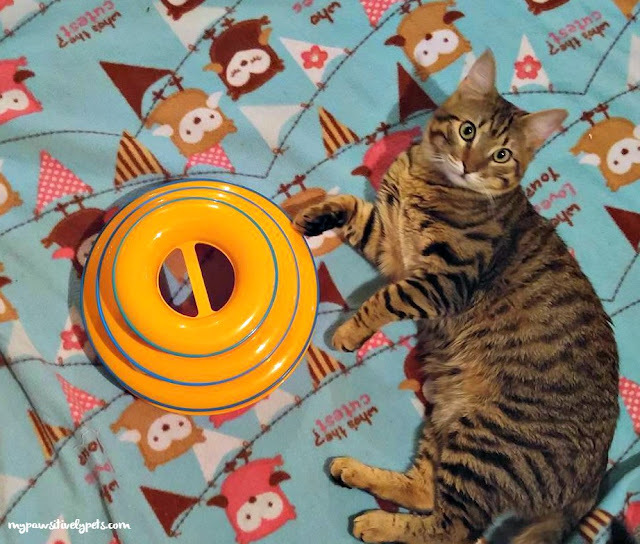 This interactive cat toy has 3 levels each with its own ball that rolls around on a track. The balls do not come off of their tracks, meaning no lost balls under the couch or fridge. It has no-skid pads on the bottom which prevent it from sliding around while your cat plays with it. The Pet Stages Tower of Tracks cat toy is a good toy for multiple cat households since more than one cat can play with it at a time. My older cat, Callie, has shown little interest in this particular cat toy. Of course, that may just be because Roadside is so infatuated with it. She tries to avoid him most of the time, so I think if it keeps him busy she's happy enough with that. As for Roadside, he was in love as soon as he laid eyes on it. He sat and played with his new cat toy for hours when I first opened it. It's nice because he can play by himself whenever he wants. Even when I'm not around. The toy requires no human manipulation. Although my youngest human child seems to think it's fun to play with as well. It's a BIG hit with our kitten and not so much with our older cat. I think the Pet Stages Tower of Tracks cat toy is a great way to keep him busy and out of trouble. It's an affordable cat toy that we definitely recommend to cat parents. Roadside gives it 4 paws up! You can find this cat toy, along with many other cat toys at Chewy.com. In fact, you can find just about anything you're looking for at Chewy.com. Treats, toys, pet food, grooming products, pet medicine, pet beds, cat litter, and more. Chewy.com ships out fast and offers free shipping on purchases over $49. 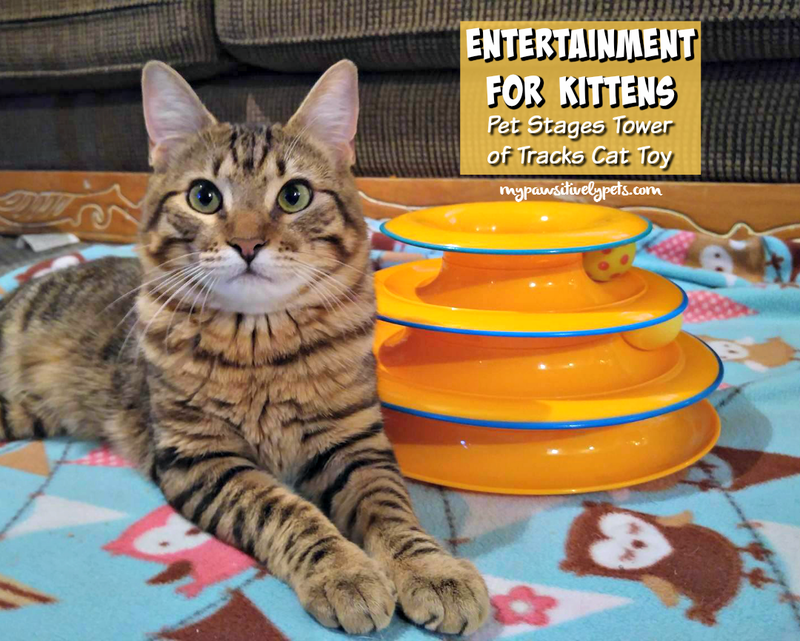 We received a Pet Stages Tower of Tracks cat toy for free for this blog post. What do you think? Would your cat play with a toy like this? considering our kittens love our small trackball, this might be a hit. Oh my, I'll bet our newbies would sure like that thing! Roadside really does make that toy look like lots of fun! It's the sort of thing that Boodie really likes... and she is 15! Few joys are greater than watching your cat enjoy a toy you actually gave him ... for hours! What a fun toy! Nothing like keeping a kitten occupied. Lucas would love this toy. We have a different cat track that we pull out from time to time (which he is obsessed with) but that only has 1 layer and 1 ball! That would be ideal for young kitties. Cat bro Bert used to climb our tree the first few years he was with us, but now has given up that hobby, thankfully. Wow, Roadside has gotten so big! I love his beautiful tiger-striped legs. :-) I saw this toy on the Chewy website but wasn't sure if Piper would like it.. I think I'll give it a try! Wait! No lost balls?? Oh, we are so all over this! Thanks for sharing! Merry Christmas to you, dear pals!